You would think that more whisky producers would have jumped on the ‘green’ band wagon. Strange then that there are currently only 2 Organic whiskies available. This is one of them. PC 8 is almost all gone (see link below) and this new bottling is a further very positive step on the way to putting Port Charlotte firmly back on the (whisky) map. The older this gets, the better it becomes. One of those ‘Marmite – Love it/Hate it’ type whiskies. If you’re a peat fan you can’t get more heavily peated than this. Young, cask strength and did we mention; very heavily peated! Not a definitive guide, simply a selection of 101 whiskies well worth trying. Is your favourite dram amongst them? LAST CALL! PC 8 no longer available from suppliers. Only a few bottles left! To order PC 8 Click Here! Berry Brothers have rapidly established themselves as a major player amongst the independents. Another couple of impressive bottlings; a great, but not so common Highland single malt and a superb grain whisky. A terrific new bottling from Campbeltown of the completely unpeated Hazelburn. Fruity, sweet and delicious. 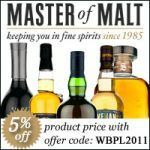 Springbank continues to produce an amazing variety of cracking malts. ‘The Rather Refined’, ‘The Rather Enriched’ and ‘The Exceptional’. Three quality malts from the modestly revived Glencadam distillery in Brechin. Amazingly good value on the 21 year old. It’s been wonderful to witness how this modern, late 20th century distillery and it’s single malt have developed since opening in 1995. Arran distillery may still be in it’s infancy, but it’s spirit is strong and good! This is replacing the soon to be discontinued 1997 bottling. Balblair is one of our favourite Highland malts. They use a high pecentage of bourbon casks for maturation, producing a lovely vanilla, caramel, fruity and mildly spiced character. In the past, ‘spiced rum’ meant a sickly sweet drink with lots of added vanilla flavour. Nowadays the spices are actually infused in the rum resulting in a more fullsome and fantastic flavour. Great on their own or mixed in cocktails. A Caipirinha (which roughly translates as ‘Peasant’s drink’) is one of the finest drinks known to humankind. Feel good about yourself and the enviroment by using either of these 100% organic cachaca’s to make it. Click on link below for our current fantastic deals and offers.